Yo-Ho-Ho and a Barrel of Fun! 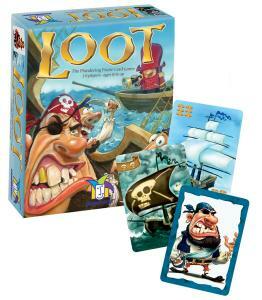 Set sail for an exciting adventure of strategy and skullduggery in this captivating card game. Storm your opponents' merchant ships and seize valuable treasure. But watch your back, matey â€” plundering pirates are out to capture your ships as well! The player with the most loot rules the high seas. Weâ€™ve talked about making a pirate-themed game for years but wanted to wait until the right one came along. From the moment we first played Loot, we knew we found our buried treasure! Renown game inventor Reiner Knizia has created a highly clever card game that is at once simple to learn and fast to play, while engaging those looking for strategic challenge. Weâ€™re particularly fond of the team play version, where you and a partner get to look at each otherâ€™s cards and conspire moves. We find that the gameâ€™s even more fun when everyone talks in pirate accents when playing. Give it at try and youâ€™ll be hooked! Great card game. Especially fun with 4 players playing in 2 teams. A great game to play as a family with children. Pirates + Gamewright = another purchase. Gamewright packs a lot of play into their card games, and this one is no exception. A great theme with quality cards. Fun will be had by all.